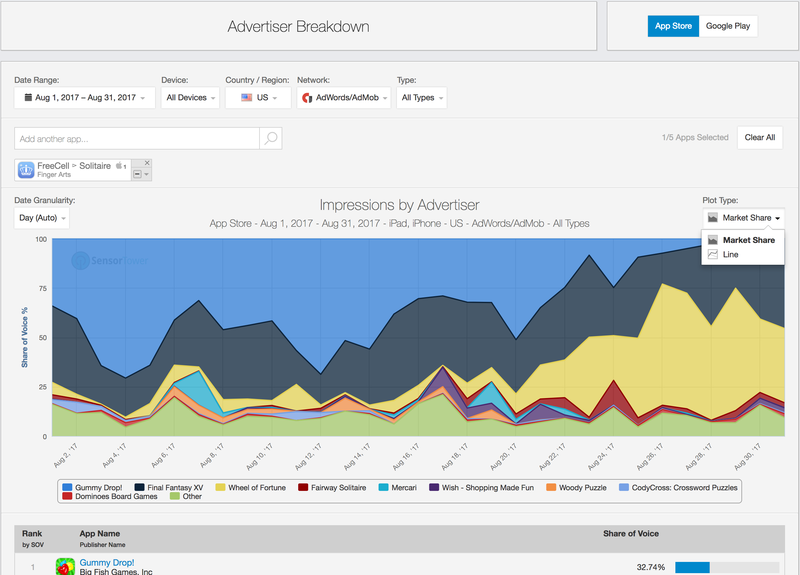 The Advertiser Breakdown feature offers insight on the most prominent apps advertising in a particular publisher in any country, across all major ad networks, and for any date range. The graph displays a graphical breakdown of Share of Voice (SOV) by advertiser. Identify which advertisers are running the most ads within a publisher to determine how your competitors are running their mobile ad campaigns. You can switch between a line chart and a market share chart by clicking on the Plot Type drop-down menu. Below the Share of Voice (SOV) graph is a ranked list of the top advertisers by SOV in a given ad publisher for the selected time period that includes the SOV for the selected date range.